Figure 1: Bruxism (tooth grinding) led to the loss of nearly 50% of this patient’s visible tooth structure. Bruxism is a chronic habit of clenching or grinding the teeth. 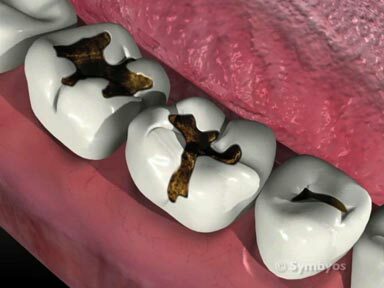 Its significance lies in the potential damage the habit can cause to the teeth, jaw muscles, and jaw joints (all three elements of the body’s stomatognathic system). Severe wear (attrition) like that shown in Figure 1 can be a serious problem, and extremely costly to treat. If all the teeth are involved, the jaws may rotate together more than they should. This is known as loss of vertical dimension of occlusion (bite collapse). Bite collapse can result in damage to the jaw joints; severe pain or dysfunction in the jaw joints (TMJ dysfunction); excessive muscle contraction forces as the closing muscles of the jaw shorten (which can accelerate the destruction); tooth fractures, and tooth loss; aggravation of periodontal disease (secondary occlusal trauma); shortening of the lower face height (which changes one’s appearance); an inverted smile (corners of the mouth sag); frequent cracking or chapping at the corners of the mouth (angular cheilitis); and problems chewing. Teeth that don’t mesh properly can wear at an accelerated rate, even under normal function. 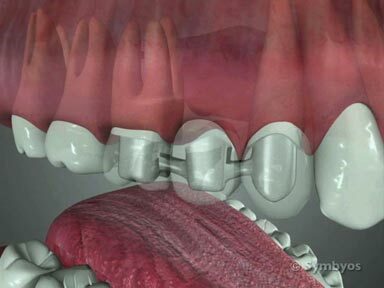 If you have this problem (known as malocclusion), ask your dentist if orthodontics might be an option. Factitious habits: Repeatedly chewing on hard or abrasive objects, biting your nails, grinding sunflower seed husks and other habits like these can accelerate the formation of wear facets (flattened planes) and chips on your teeth. An occlusal guard (night guards) won’t help with this, but you may need the chipped or worn teeth repaired with bonding, fillings, or crowns. And you should try to quit the habit to avoid re-occurrence. How does the dentist diagnose Bruxism? Visual examination of the teeth, and patient history are the most important components involved in establishing a diagnosis of bruxism. The most important thing to consider is whether or not the habit is currently active, or whether the signs of bruxism reflect a habit that is no longer present. Craze lines, cracks, or flat spots (wear facets) that are visible in your teeth, and get noticeably worse over relatively short periods of time. Your dentist may be able to track it with photographs of key wear spots at each visit. Bruxing can be episodic, meaning it can follow the patterns of your life. For example, you may have experienced a stressful childhood, stressful job, graduate school, child-rearing, or another high stress time of your life, when you DID grind your teeth; but perhaps you no longer do. Your dentist may take diagnostic photographs of the wear marks (facets) and other wear signs (e.g. craze lines) on your teeth and evaluate them for changes for a few successive checkups. Often there will be at least one good landmark (e.g. the tip of a canine tooth) to compare from one visit to another. If no symptoms are present you may not need treatment for bruxism, but the damaged teeth may still need to be repaired. Conduct an honest appraisal of your stress level history. For example, childhood bruxism may show up as wear facets in the six-year molars and incisors, but not in the twelve-year molars. If the wear planes on your upper and lower teeth no longer line up, your bruxing period may have occurred prior to orthodontic tooth movement, or before your jaw growth and development was complete. Pay attention to your symptoms—do you have tired or sore jaw muscles? Clicking, popping, locking or grating jaw joints? Headaches? Pain when you bite or close (from the teeth or joints)? If the answer to each of these is “no”, bruxing itself might have been in your past. If continued bruxing is suspected, your dentist may recommend an occlusal guard (also called a night guard, or splint) to help reduce forces on the teeth, control muscle contraction, and allow reduced forces in the temporomandibular joints (TMJs). Bruxism is sometimes caused by improper alignment of teeth. In such cases, the patient is subconsciously attempting to achieve a “balanced occlusion”—even contact of the teeth when the jaw muscles are at rest. These patients are generally candidates for orthodontic treatment. Bruxism has been identified as a habit common to certain personality types, including those who are anxious and those who are very competitive. It is also a common reaction to stress. If you are a person who is frequently anxious or under significant stress, you might benefit from an appropriate exercise regimen, adequate rest, and proper nutrition. You may also wish to learn more about alternative solutions such as biofeedback, meditation and yoga. You may be a candidate for certain medications to control anxiety and stress. Ask your physician to help identify possible non-dental sources of your bruxing habit and ways to help control them. In many patients, regular exercise helps to control stress. 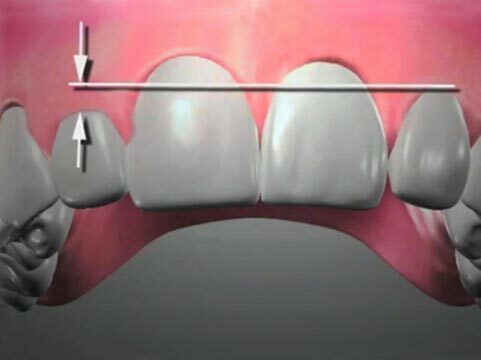 Treatment options for teeth that have been damaged by bruxing (attrition) can be extremely costly, as it is sometimes necessary to place crowns on most or all of the teeth to re-establish the proper “vertical dimension of occlusion” (the vertical separation of the jawbones when your teeth are fully engaged). Crowns or onlays may also be needed to re-establish proper chewing efficiency (mastication) needed to break down food for healthy digestion; and to re-establish durable chewing surfaces. Placing dental restorations (like crowns or onlays) on all or most of the teeth is called “full mouth rehabilitation.”This type of treatment may be indicated if you have chronic pain or dysfunction in your jaw joints, frequent muscle tension headaches, or chronic pain/fatigue in your jaw muscles (myalgia); or you’ve simply broken and worn down your teeth to the point that they are vulnerable to decay; chipping and cracking regularly; inefficient at chewing; cosmetically compromised; and/or wearing at an abnormally high rate due to loss of their enamel layer. There can be other indications for rebuilding a patient’s dentition. A summary of the most common dental procedures that are commonly involved in the treatment of bruxism and its damaging consequences include: equilibration, fillings and core buildups, occlusal guards, orthodontic treatment, diagnostic photographs, crowns, onlays, veneers, fixed bridgework, dental Implants.